The all-new 2017 GMC Acadia Denali mid-size luxury SUV is designed to make a lasting impression. Its bold, sculptural lines, advanced technologies and refined details are the marks of Professional Grade engineering.It combines premium materials, signature styling and advanced technologies for a driving experience that is unmistakable. This distinctive design is the result of smooth, flowing lines running uninterrupted from front to rear. Luxurious Chrome appointments and features leave little doubt it’s every inch a Denali. 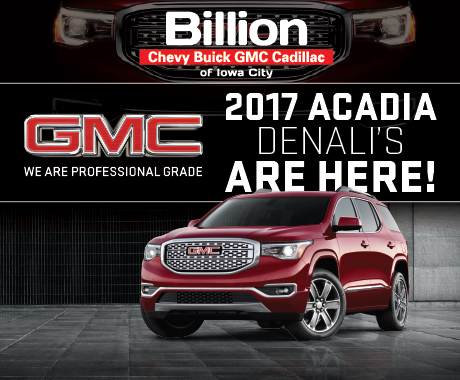 Visit your Iowa City GMC Dealer today!